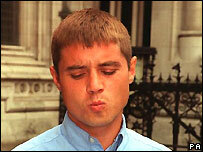 Former London's Burning actor John Alford has been given a 16-month ban after admitting drink driving. Highbury Corner magistrates heard the 34-year-old crashed his Rover car into three cars in Islington, north London, on 2 April last year. He also gave a guilty plea to driving a defective vehicle after the car was found to have a dangerously deflated front wheel. Alford was also ordered to pay a £150 fine and £100 costs. A charge of leaving the scene of an accident was withdrawn last year. The actor, who also starred in Grange Hill, was jailed for nine months in 1999 for supplying cocaine and cannabis to a bogus Arab prince.